Located within the picturesque and world-class, guard-gated community of The Bridges in Rancho Santa Fe, California, this stunning Tuscan-inspired home is sure to please. Situated on the 3rd fairway of the iconic golf course, it is surrounded by rolling hills and lush, colorful landscaping. Created by renowned Rancho Santa Fe architect Dena Gillespie, this custom home has been masterfully designed to allow for luxurious private living and relaxation, or, alternatively, entertaining on a grand scale. This stunning home, specifically constructed with main-floor living in mind, boasts over 5,500 square feet of immaculate living spaces, including an area upstairs that could potentially be converted into a two bedroom guest house with its own private entrance. 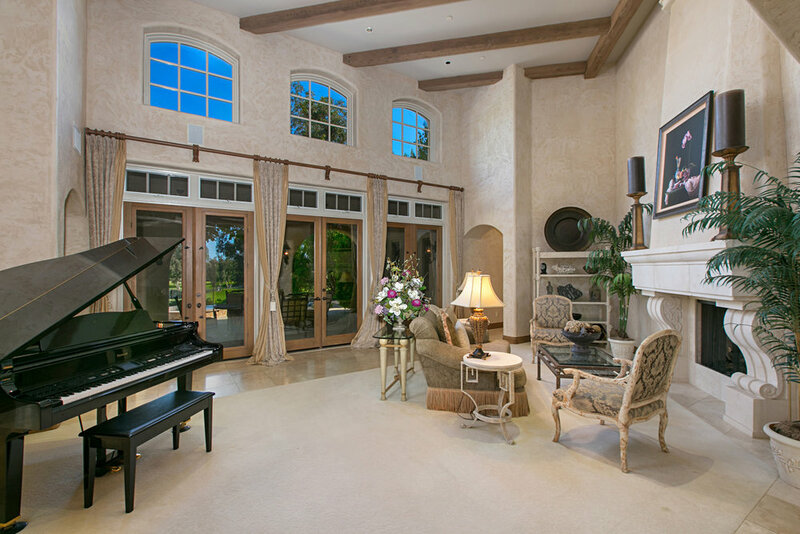 From the arched grand entry to the stunning foyer featuring soaring ceilings, this home offers luxury at its finest. 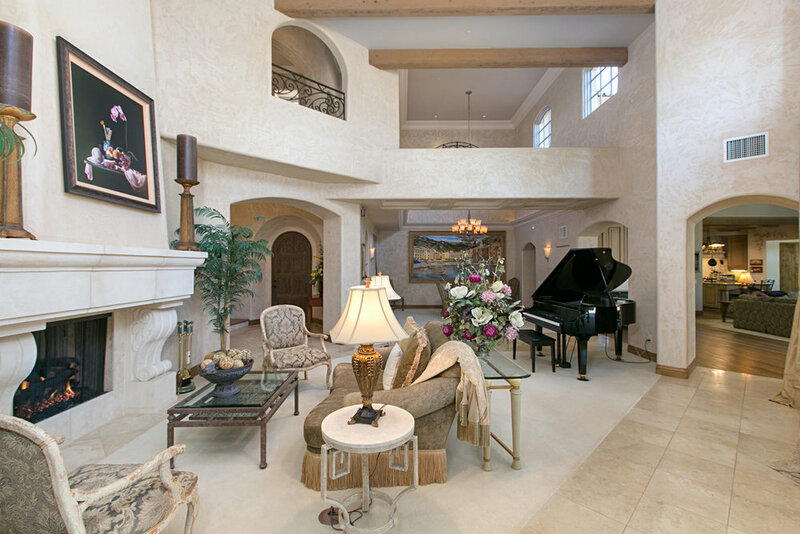 Entertain in the elegant living room, complete with ornate fireplace. 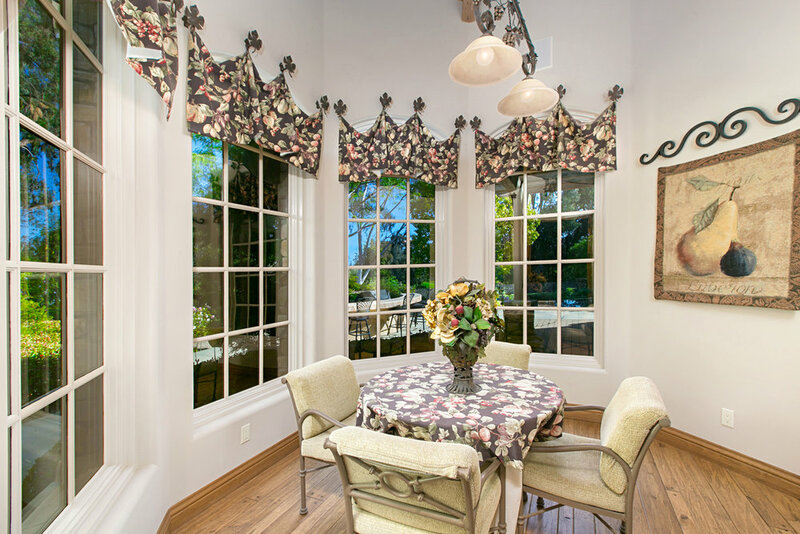 The numerous French doors and windows not only allow for the abundance of natural light to permeate the area, but also showcase the stunning views from nearly every room in the home. Gorgeous vintage timbered ceilings, a large stone fireplace and pecan flooring grace the spacious family room. Still more french doors lead out to the breathtaking backyard, providing a seamless transition to indoor/outdoor living. Unleash your inner chef in the gourmet kitchen with top-of-the-line appliances including 3 ovens, 2 dishwashers and Subzero appliances. 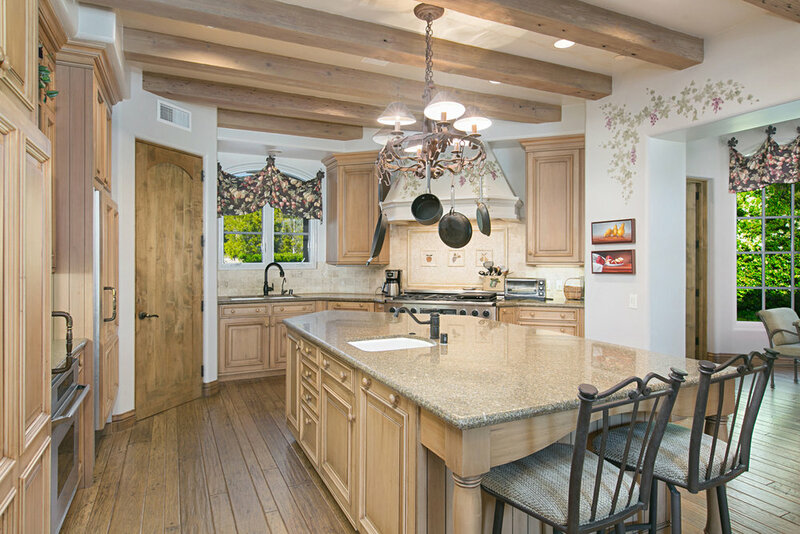 Enjoy a quick snack at the large center island, breakfast in the nearby morning room, or host an intimate dinner party in the formal dining room. 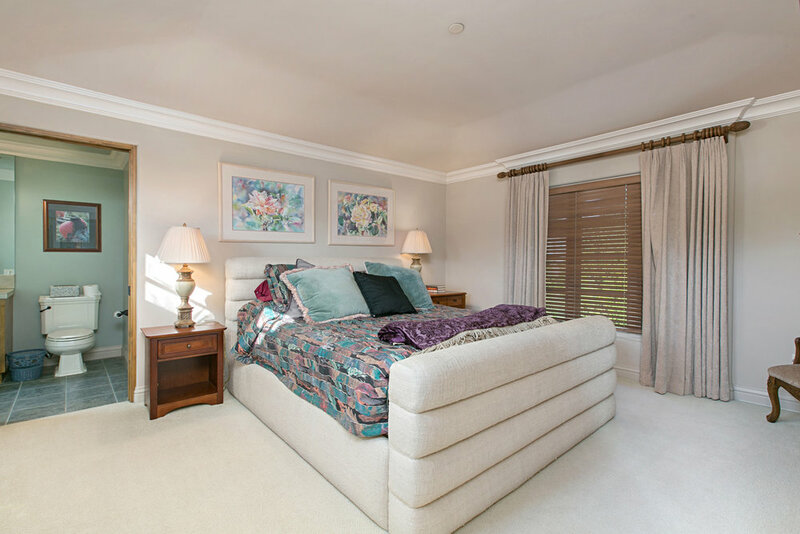 Relax in the ground floor private master suite, featuring multiple custom built-ins, a fireplace, spa-inspired master bath with steam room, spa tub and heated floors, or sit in your own peaceful private patio located just outside. A home theater media room, creatively designed art room, and stunning, spacious home office, all with extensive built-in storage, can also be found on the ground level. Take the elegant staircase upstairs to the two en-suite bedrooms, additional living room, then return downstairs by way of the private outdoor staircase, leading you directly to the backyard area. Once outside, enjoy the outdoor kitchen BBQ area as well as the sparkling infinity edge pool and spa, all with stunningly beautiful golf course views. After a day in the sun, the covered loggia with outdoor fireplace provides the perfect space for both relaxing and entertaining. The Bridges is a world-renowned, guard-gated community and includes amenities such as the Robert Trent Jones II-designed golf course, state-of-the-art clubhouse, full-service day spa, not to mention the exquisite pool, gym, and professional tennis and basketball courts. Between this home’s incredible offering and the world class community in which it’s located, this stunning property is the perfect place to call home.